There’s a theme here where I can’t seem to stay on top of my reading list at all…I finally got round to reading the May book from the Reading in Heels box, but before we go in on my review, let’s have a quick chat around the contents. As has begun a theme, the sweet treat in the box got eaten whilst looking through the rest of the contents. I can confirm that these little chocolates from Paxton were just a delight. They came in two flavours; Matcha Sea Salt Caramel and Raspberry and Rose. I’m not usually too keen on floral flavours as is evident with my borderline hatred for Parma Violet gin, but the rose flavour was so delicate that I didn’t really notice it. I would say in terms of quality, these little chocolates are up there with the quality, if not better than, Hotel Chocolat. They’re definitely a treat. If you’re a chocolate guy or gal and want to know more, they do a tasting club which follows the format of a subscription box. You’re welcome! We all know I’m a coffee gal, so I was pleased with the Colombian Coffee Bag from Percol. I’d never actually heard of coffee bags like this one, but definitely think it’s something I’ll look into purchasing some of these. Much nicer than the stuff out a jar! The INC.Credible Cosmetics, Matte My Day Future is Female Lipstick is nice. It’s a liquid lipstick which isn’t something I’d usually use but it’s a great shade, so I’ve been using it occasionally and I’m gradually warming to it. Then of course, there is the adorable bookmark from Louie Tilley which couldn’t have more fitting words if it tried. “So many books. So little time.” Love the sentiment of this. I’ve always been useless with bookmarks and instead try (and fail) to remember my page number. The main event of course is the book! This month I was treated to “The Invisible Life of Euridice Gusmao” by Martha Batalha. I’m going to be honest. This is not my usual read by a long shot. But that’s the beauty of the Reading in Heels subscription box. Right? This book gripped me. It was a funny read in that it didn’t really feel like anything major happened. It didn’t particularly reach a “climax” for me. It was just an honest account of what life was like for Euridice and her sister Guida, in 1940s Rio. There is an author’s note in the front telling you that the story of these two main protagonists are real. As I read, I found myself wanting to learn more and more about their lives. Particularly that of Euridice. See, Euridice is brilliant. But because of the time and culture in which she lives, she is unable to be as truly wonderful as she has the ability to be. 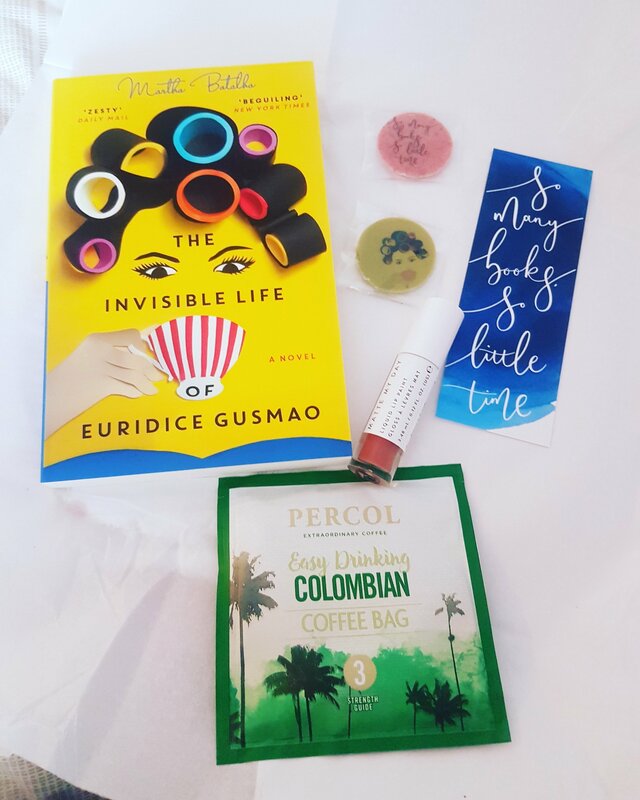 I found ‘The Invisible Life of Euridice Gusmao’ a powerful, eye opening and insightful read. I really loved this book and would give it a 4.5 stars out of 5.